Date of 2005 London-Brighton Commercial Run ? : On May 1st. David Hanks gave us loads of grief with this one, to the point where we managed to get the photo published in The Automobile. 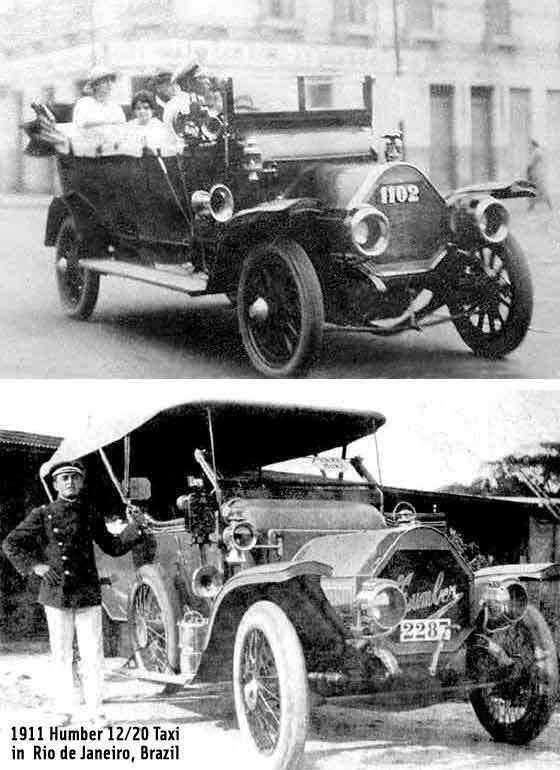 At about the same time our own Desmond Peacock also managed to identify the cars as a 1901 Toledo Steamer and a cca 1902 Mors. The Toledo was the main problem so the subsequent info obtained during our researches is on the Toledo Steamer Page with pictures of a current car in the UK. Interesting photo received from Kathy Diaz, Torrance CA (USA) of her grandparents in a magnificent car taken in northern California (probably San Francisco or Santa Cruz area). Her great grand mother was pregnant with her grandfather and he was born in 1913. 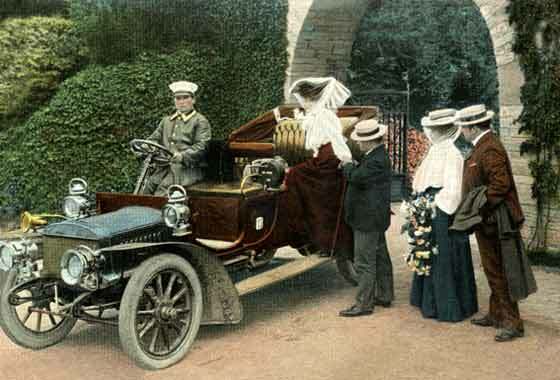 The car is a late 1905 Pope Toledo, possibly early 1906 as the running boards etc are enclosed. Pope in USA had a number of car companies at that time. Photo from Steve Nield (Switzerland) advising he had recently discovered an old photo album containing photographs of a car which he would like identified. The photo is dated October 1909 and was taken somewhere in Switzerland. 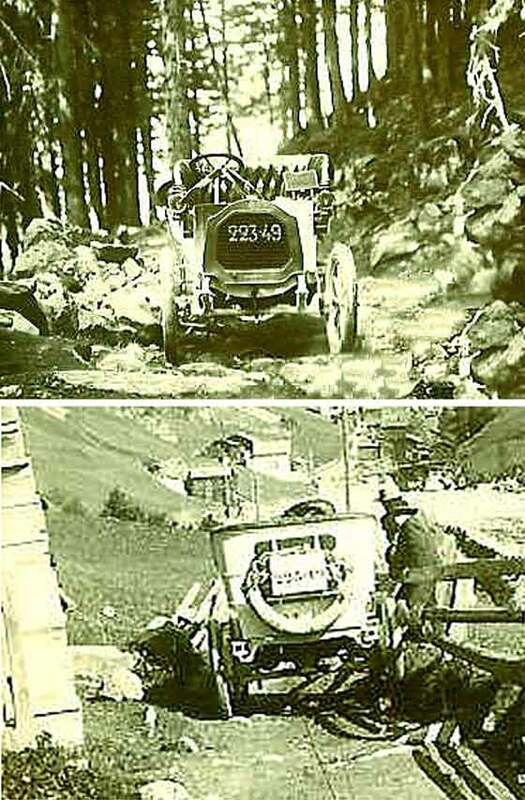 Evidently the photographs were used in the Strand magazine for an article on mountain motoring in Switzerland. 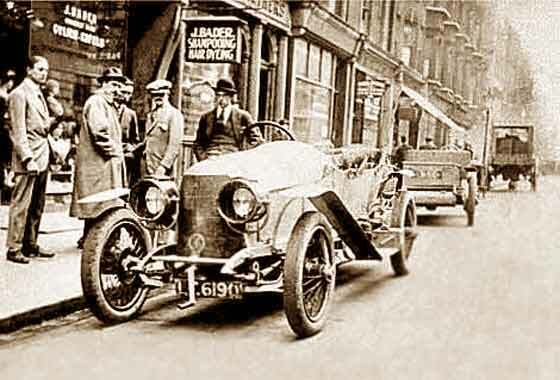 We are pretty sure that the photo is that of a cca 1908 De Dion Bouton. Intriguing photos received from Leslie Ann Murray from the American Chamber of Commerce of the Philippines requesting dating and information on De Dion-Bouton busses and lorries, which resulted in some in depth research uncovering a fascinating story of the building of the infamous Kennon Road and introduction of Stanley Steamers and later De Dion-Bouton road trains to the new summer capital of Baguio. 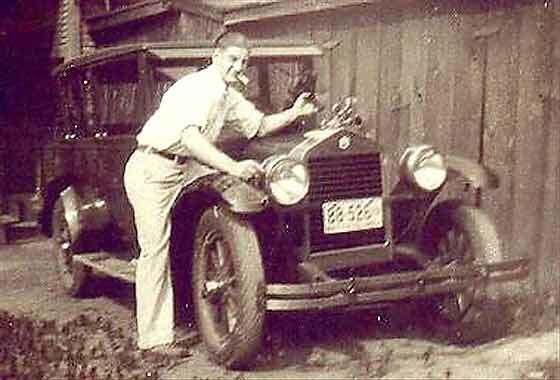 Photo from Jason Vogel from Rio de Janeiro (Brazil) of grandfather's car in 1916. This took some time to identify and we were not expecting it to be British. It turns out to be a cca 1911 Humber. 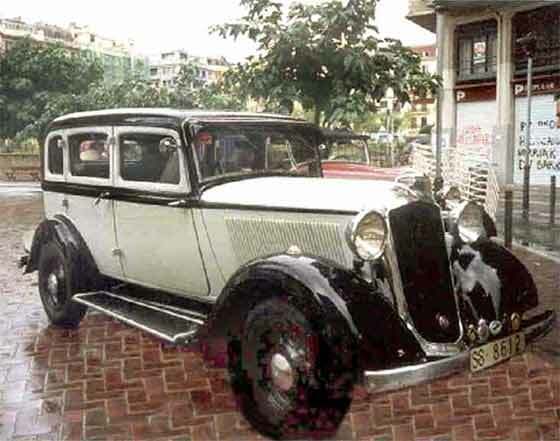 While researching came across a similar age car in 'The Humber Story' which was of a Taxi and amazingly also photographed in Rio. Obviously an active Humber agent then. Interesting changes to number plate numbers and colours. 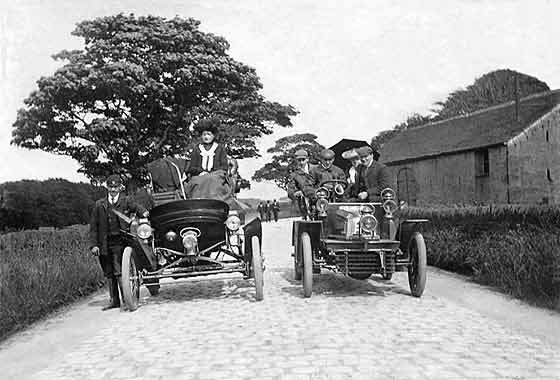 Photo received from Michael Heaton, the Archivist of the Spratton Local History Society (UK) asking for identification of a car pictured at the start of the Monte Carlo rally in 1913 and owned by a famous local resident William Rhodes - Moorhouse. He was the first airman to receive the Victoria Cross and was killed in action in 1915. 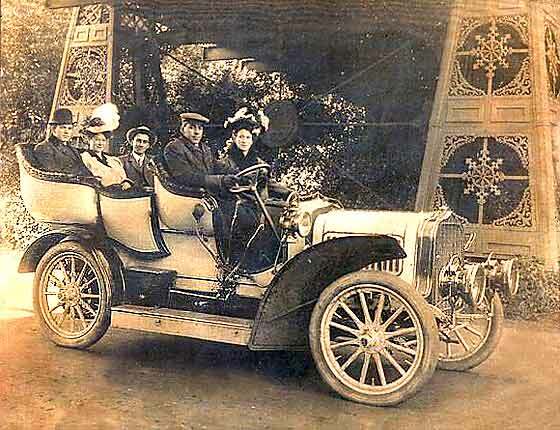 The car is a 1912/13 Austro Daimler, who were also into manufacturing aeroplanes. The Austro Daimler Register in Neustadt say it is a "Prince Henry" type. Another great photo from Dave McDonald (UK) taken in Malaysia of his Great Uncle. This one is of a cca 1913 Bedelia Cyclecar. 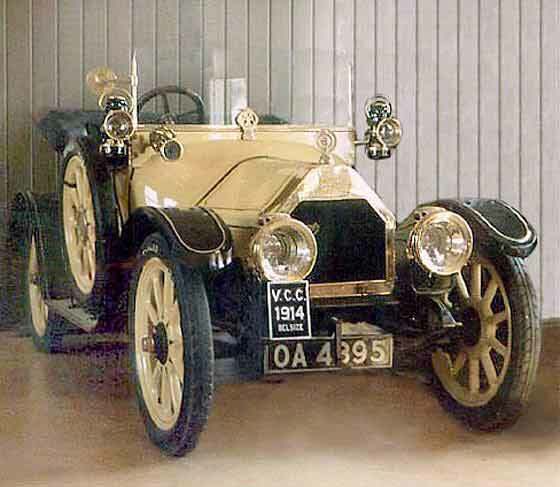 Bedelias, made between 1910 -1916, were the first of the French cyclecars and set the pattern. The seating was in tandem, driver in the back. Belt driven two speed engines of 3, 5, and 10HP. Some were used in WW1 as a machine gun carriers, with passenger firing, and also as stretcher transport. Contacted last year by Mark Bowell (Ireland) advising an aunt is trying to sell a 1914 Royal Enfield car purchased in 1996 unrestored, and asking for current valuation. 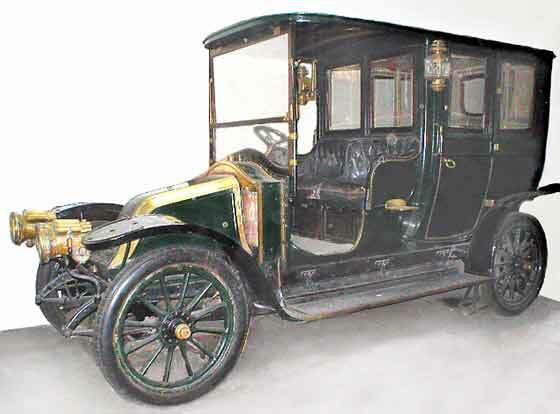 We advised this is a relatively rare car and corrected that this is in fact a 1914 Enfield (Enfields between 1910 -14). We took advice on value and passed it on. Car is now complete, owned by Gemma Bowell, and available FOR SALE at E30,000 in Ireland. Picture Postcard 'Early Motoring' received from David Hanks (UK) showing an old vehicle which he asked to be identified. This one took some time to tie down but was eventually identified an Adler from Germany. Careful study of the photo reveals that the car is fitted with a meter, so it was an early taxi. Not obvious in the photo are two jump seats behind the driver, so could carry five in the back, and two front. Third picture received from Joseph Seymour (UK) of his father at work in his taxi. Joe was not sure of the make but thought it was a Daimler. It is indeed a Daimler and a 1918 Daimler Landaulette. This was quite a big car. 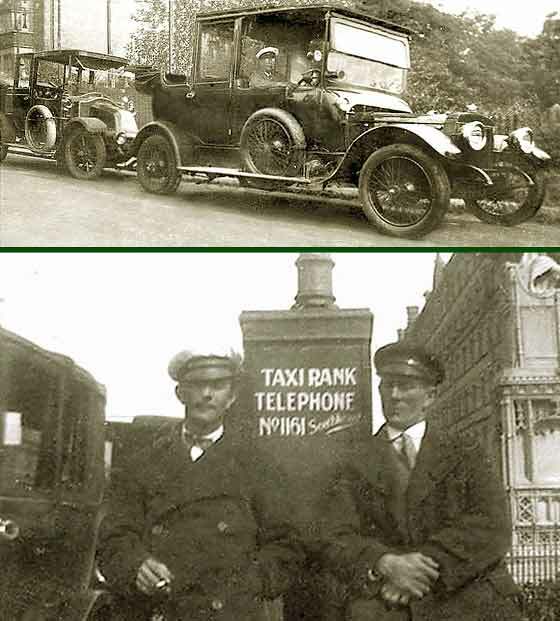 On the same picture, which is a composite of two photos, is another taxi which we think is a cca 1914 Reanult Landaulette of which over 1000 used worldwide. Also used to transport soldiers to WW1. Another picture received from Joseph Seymour (UK) of his father this time on an outing to Southend-on-Sea in on open charabanc in the 1920s. The vehicle is a 1919 Daimler Charabanc. 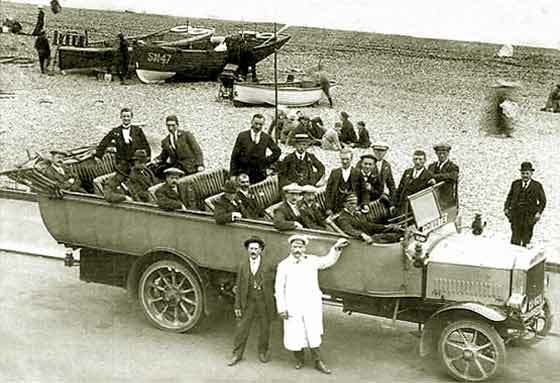 Sometimes the word charabanc is broken down into 'char-a-banc'. Francophones use 'char' for car, and 'banc' is a bench. So a charabanc is a car with benches. A great summer treat in those days was a Mystery Tour on a charabanc. 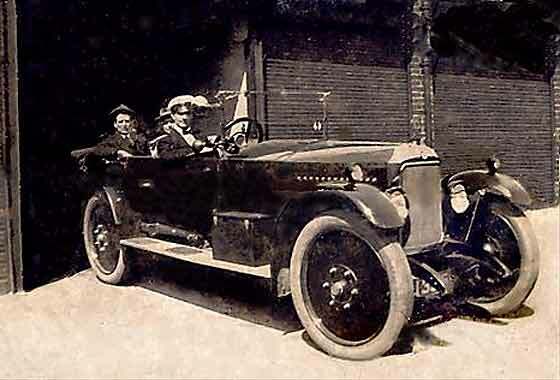 Lovely picture received from Joseph Seymour (UK) of his father at the wheel of a car taken in the 1020s. 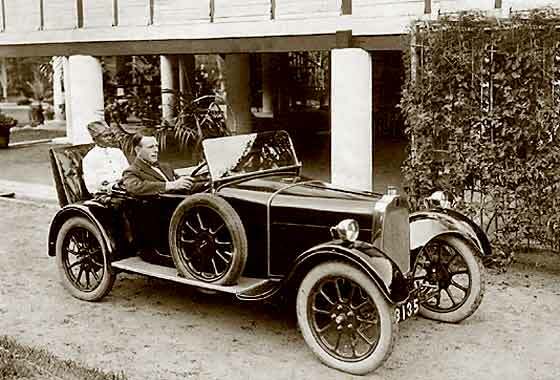 Distinguishing feature is the fluted bonnet, and from from disc wheels relatively sure the that the car is a Vauxhall 14/40, M series 'Princeton Tourer, four seater, having a four cylinder engine of 2297cc, giving 25/28 mpg. It was built between late 1921 and 1924, capable of just over 50 mph and had rear brakes only. 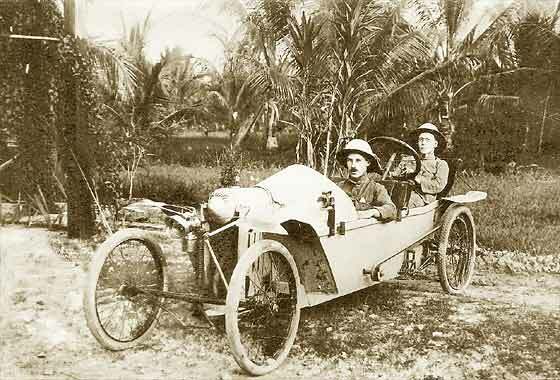 Photo received from Dave McDonald (UK) taken in Malaysia of his Great Uncle in two cars. This is a Talbot 8/18 made in England between 1922-26. The 'servant' in the back was probably the 'chauffer'. When the 'master' would want to drive, but may not want to be bothered with parking or retrieving of it later, the chauffer would be 'in the back' ready to take over when the master was too incapacitated to do so. 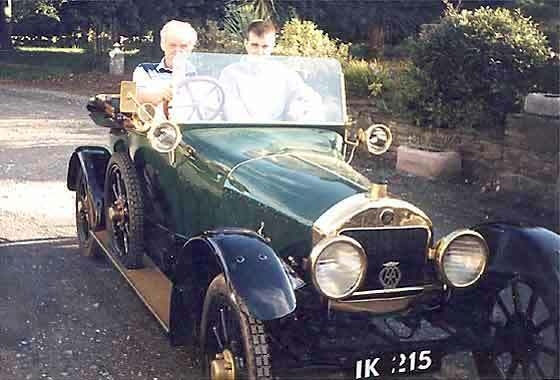 Stewart Harrowing from the (USA) sent us this photo showing a 1920s car. 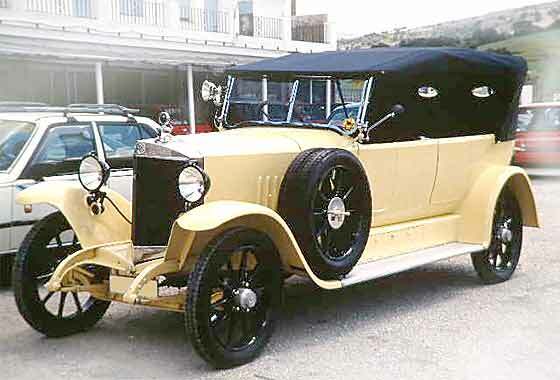 While we are not experts on American cars, we are pretty sure that the car is a cca 1924 Essex Sedan. Although Essex is the name of a county in England, the car was made by a branch of the Hudson Motor Company in Detroit. We think the year indicated is relatively accurate because that type of radiator was used for a relatively short time. Eddie Donn from Middlesex (UK) took a photo of the car on the right while in Spain some years ago and has been trying ever since to find out what it was. At first glance the car had the Benz type radiator but is clearly not a Benz or a Mercedes. The rad only helped to confuse because many Tutonic cars had them, but this is an Austrian cca 1924 Steyr Type 5 , who also made armaments and logo represents a target. 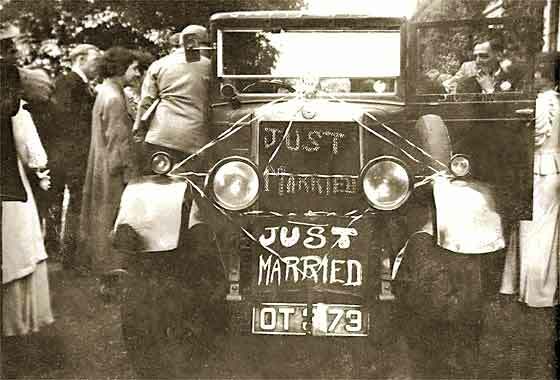 Photo received from Paula Clements (UK) of her parents wedding car. Our Morris expert Chas Moody advises it is a 1927 Morris Oxford, identified by two 'styling' ribs on the doors (Cowleys had one). 1927 indicated by two piece windscreen and two piece mudguards, Sept 1926 to Aug 1927. Registration OT is Hampshire / Southampton area 1926 and 1927. The Bullnose Morris Club has no record of this car surviving. Photo received from Kamal Tuladhar of Bhakta Bir Singh Tuladhar, from Kathmandu, (Nepal), taken in about 1947 in Kalimpong (West Bengal, India). Many Newar traders of Kathmandu operated business houses and shops in Tibet, and travelled to Lhasa by mule caravan. Kalimpong, a staging point for caravans, was a rest point between trips to Tibet. 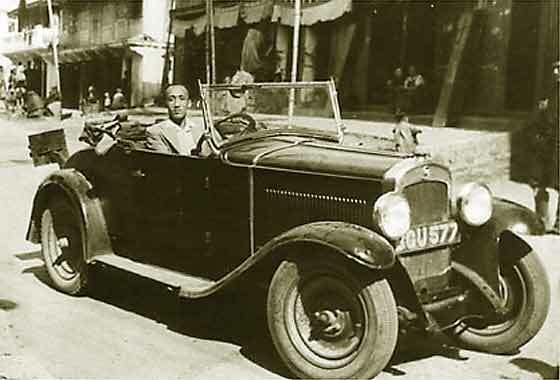 The car is probably a cca 1931 Fiat Model 514 built between 1929-1932. 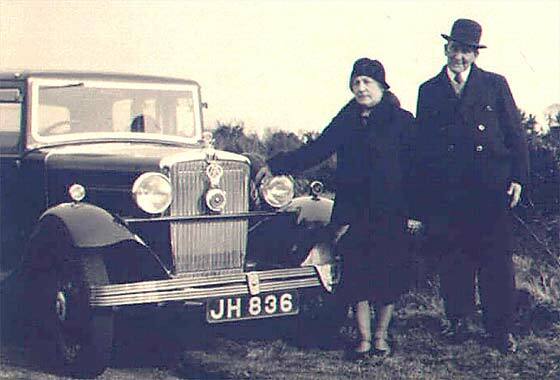 Photo received from Marianna Worthy (UK) of her grandparents standing in front of their car and wanted to know what the car was. Confirmed by our Morris man Chas Moody that it is a 1932 Morris Major. Temperature controlled chrome shutters and twin blade bumper were introduced in 1932. (1931 had black shutters and 1934 a centre strip). Six cylinder LE side valve engine of 1803cc and a four speed gearbox. Photo from Ian Smith (UK) of his late father-in-law Ted Hone who lived in Oxford. 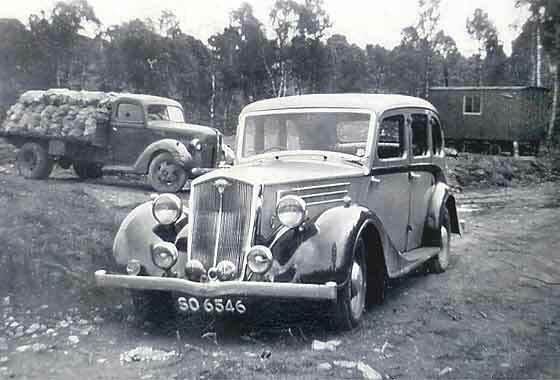 The car is not known to the MG register as survivor. 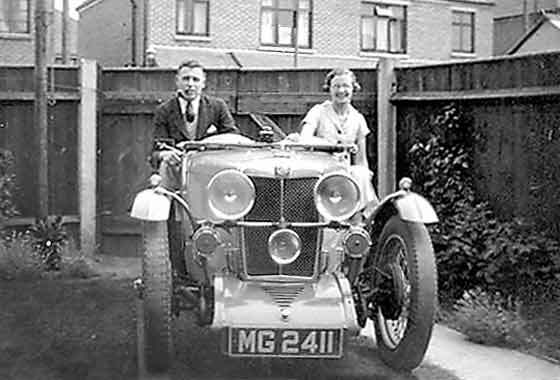 The UK plate MG 2411 belonged to a MG J2, chassis J 3152 built on 31/3/33, supplied ex factory to University Motors 26/4/33, and sold on 1/5/33 to S. Spigel. The J1 was a four seater and the J2 a two seater; J3 and J4 were supercharged. Photo taken in Portsmouth, just pre or post war. Photo received from Ignacio Alonso from San Sebastian (Spain) who is an enthusiast of vintage and classic vehicles and is a keen collector of car photos. He requested identification of the car on this photo. This one did the rounds and took some time to identify, but our Dutch correspondent Fer Cools suggested it could be a Hudson 1932/5 Essex Terrapalne. Maybe one of our USA readers would be able to confirm ?? Photo received from Jill MacRae (Scotland) asking for identification. From the badge, quick identification is that the car is Wolseley.. From the lower slung headlights and smaller dip in the bumper it is probably a Series II. It looks beefy so it is probably a 18/80, and from the mudguards flowing into the running boards, it has a Salon de Ville body. These were built between 1936/8. The car was registered in Morayshire. 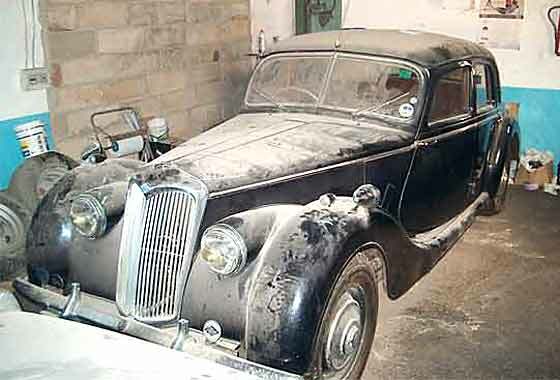 Andrew Elderfiel sent a photo of a Riley which is languishing in a garage in Mallorca (Spain). The owner wishes to sell it and has requested identification and valuation. The light blue badge identifies it as a Riley RMB which has a 2.5L engine. Made between 1946 and 52. Similar RMF (1952/3) generally had metallic paint. 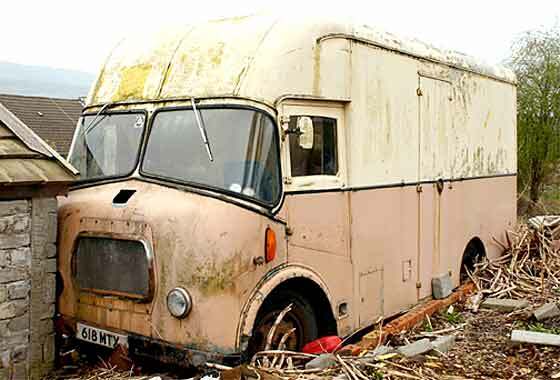 Value is dependant on condition of the ash body frame, hence from £ scrap, £3,000, £7,000, to £9,000. John Rees from Wales has sent me a photo of an old mobile library which may be of interest to someone as a restoration project. The vehicle was manufactured in 1961 by Austin, it's bodywork was made by Hemaloy and it has a gross weight of 7 tons. The registration number is 618 MTX. The last time the vehicle was used was probably in 1981, when it was driven to where it now sadly sits in Aberdare, South Wales. 1/. Clark Ross (UK) has inherited a 1969 Volvo 164 which has been in a garage for the last 30 years but started and moved weekly. Approx values are between £250 - £800 - £1,800, subject to condition. 2/. Adrian Toms (UK) was enquiring about a 1949 Rover 75, not on the road, bits off the car, and requiring restoration. Current values for 1948/9 Rover 75 cars are £800 - £3,000 - £ 4000, this one at low end. Email from Ron in California (USA) asking for a picture of a 1914 Belsize touring car. His Mother, who grew up in England from 1920 to when she moved to the USA in 1946, told him her family had a Belsize. She always wanted a picture to show her friends but he hadn't been able locate one. We have such a Belsize on the 2002 Help Page but this slightly modified photo from AUTOMUSEUM HOHENSTEIN shows it much better. Photos from Kevin van de Water (New Zealand) asking for value of his car if brought to UK, rallied and sold. This is quite a desirable car and worth UK£15/20,000. Shipping costs from New Zealand approx £1600, Value Added Tax (VAT) at 17.5% on car plus all shipping/paperwork costs. No VAT if not sold for a year. Registration with the DVLA and getting a 'period numberplate' can be expensive, then MOT inspection. 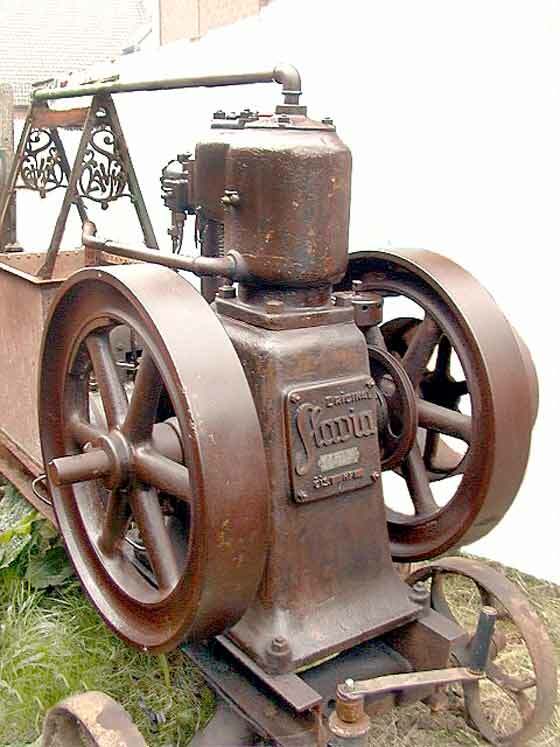 Enquiry from Kevin Rae from Forfar (Scotland) who has recently bought a Slavia Stationary Engine to restore. 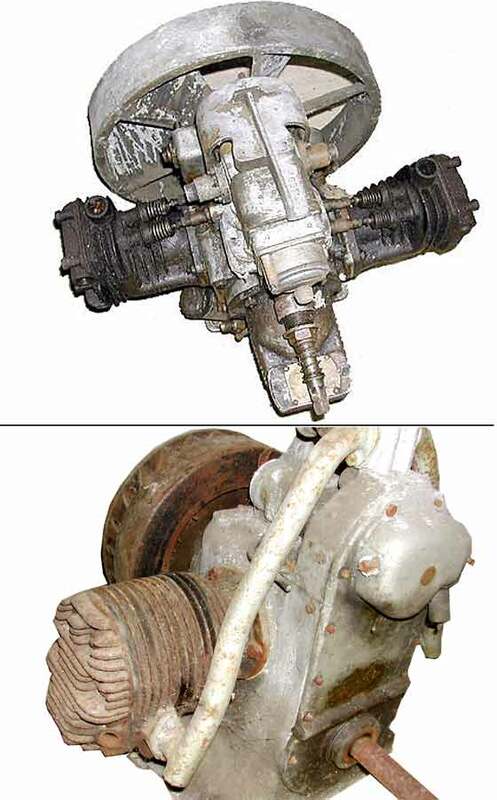 We were interested to find out more and found http://jdeklerck.tripod.com/engines_e.htm which is an interesting site on a number of less known engines including the Slavia, advising that the engine is of Czech origin from a successful company from about 1910, and making modern and reliable engines. Interesting conundrum from Graham Scott who lives on the main road in Bookham, Surrey, (UK). One day he found in his front garden a wheel from a vintage vehicle which must have fallen off something that was passing by. There are no identifying marks on the rim but the tyre has markings: The Coker Tire Company 4 Ply 525 / 550 - 19. There are 40 spokes on the wheel. We need help with identifying the make of car. Adrian Bolton has been asked to help clear a garage of a deceased friend. The family would like a reasonable value for two stationary engines which have so far been 'unidentified'. Both are twin machines with horizontally opposed cylinders and magneto ignition. One seems to be a "Norman" and the other a side valve unit with the inlets ported through the barrels. All items are located in (UK) Northamptonshire. Allan Peebles has sent me a photo of a car horn he got at a garage sale, marked Cowey Engineering Works. We need your help on valuation! Allan could find no reference to Cowey so we can advise that Cowey in Kew Gardens made speedometers and instruments, and during 1913 -1915 Cowey made a 10HP light car with unique pneumatic suspension involving car being carried on four vertical cylinders of compressed air. 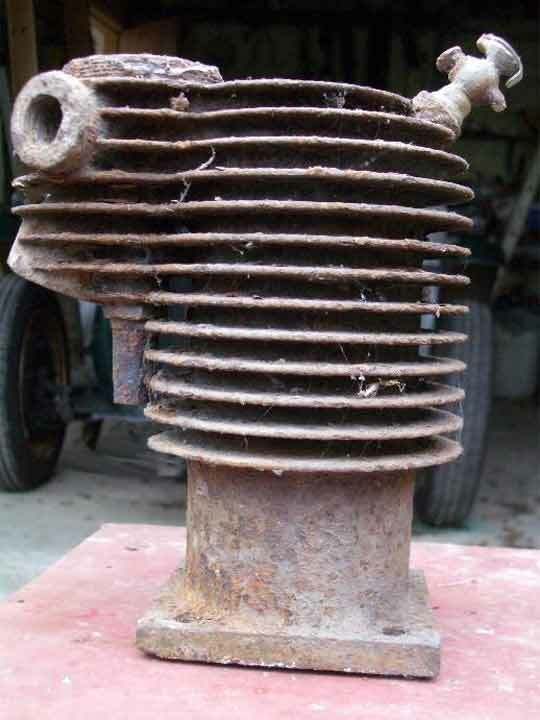 Picture of a cylinder barrel from Malcolm Buckler (Isle of Man) who has for 30 years been steadily unearthing a motorcycle from his garden. No detachable head, bore approx 2 7/8" and one valve 1 1/2". Our guys suggested half of a vee twin from a Dennis lawn mower, possibly a White engine, as the priming cup is at 45 deg. Perhaps agricultural. Malcolm is connected with www.bucklercars.com which is worth a look. Pictures of a front axle received from Charles Lofstedt (UK) requesting identification. It has 10 half-elliptic leaf springs per side. Drums are 9 inches in diameter with 3 studs. The brakeplates are aluminium. Brakes are mechanical. Each brake shoe has its own pivot, although only one cam operates each brake. Cast is an oval DDD. Our 'Morris men' think it is from a 1929 Flatnose Morris with reversed springs for use as a trailer. IDENTIFICATION AND DATING: 1920s Bentley Parts? 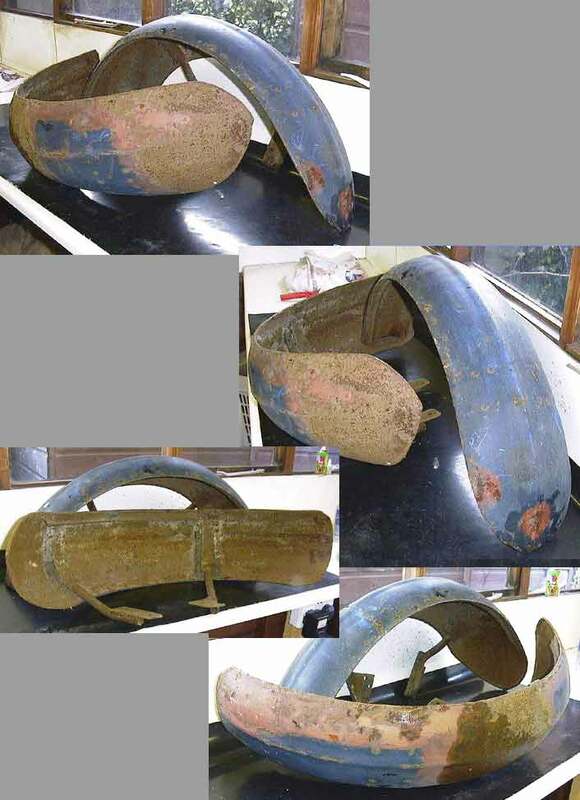 Pictures of a set of wings received from DJ Eglington (UK) possibly a 1920s Bentley. These came from a local farm barn with a number of engine items including con rods, piston rings and some 'new' items still in their original packing. Also there were a starter motor and generator, brake parts and 3 tyres, two Dunlops 935x135 and 880x12. Bentley was always mentioned when these bits were being referred to. Any ideas?